« What are Desert Wetlands? The American coot looks like a little round black duck. With a white snoot. And mad red eyes. But it is not, not a duck. After you look for a while, it also looks like a young chicken, a pullet, with a football shape, but rounder than a football. While we think of them as northern wetland animals, you can actually find them in the Sonoran desert, on some of the occasional lakes in the desert. They swim around, most often in pairs, and dive to gather vegetation, and the, um, scum from the bottom that they eat. But the most amazing thing about coots is their feet. They have very strange feet. Not just plain chicken feet. But not duck feet, webbed paddling feet either. They have these strange little flaps on the sides of their toes, very clever flaps actually, that make their toes very wide when they step down, or when they push against the water, but fold up to slender claw-width when they lift their feet, or bring them forward in the water, or take off in flight. 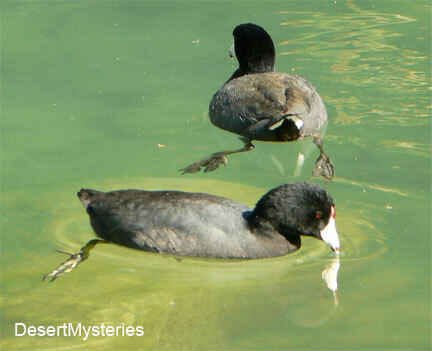 They are not easy to spot– you have to be quite close, or have the coots pose just right, then you can see them. So if you see a round black swimming chicken-duck-bird with a white bill-beak and crazy red eyes, make sure you look for their really crazy black and gray flapped coot feet. Shop Desert Mysteries Amazon Store! Shop here!